The Guardian today took an interesting and unusual look at the scale of the changes made to the Immigration Rules since 2010. A Guardian analysis calculated that over 5,700 changes have been made to the Rules since 2010 and the total word count of those changes was greater than 600,000, beating Tolstoy's War and Peace for length. According to the Guardian article, the total number of words in the Immigration Rules now stands at almost 375,000 compared to the 145,000 words in the Rules in 2010. 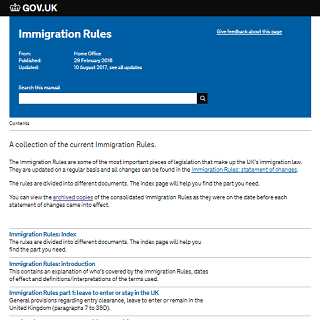 A spokesperson for the Home Office told the Guardian, however, that the number of individual changes to immigration rules should not be used as an indicator of the number of policy changes, as many changes involve minor corrections, such as changes to individual words. As the Guardian noted, the Law Commission last year began a project to look at simplifying the Rules. The Law Commission says on its website that the project will consider how the Rules can be made simpler and more accessible, but will not involve any substantive policy changes or any new legislation. The project, led by Nicholas Paines QC, is consulting on the proposed changes this year before reporting on its findings in January 2019. A spokesperson for the Law Commission told the Guardian: "The Home Office want us to help put things right. We're looking at introducing clearer, plainer language and how the rules are presented on the internet for applicants." The Law Commission spokesperson explained that the Rules had grown in complexity in recent years as there has been a policy of making them more detailed and specific. The Guardian also spoke to Garden Court's and Free Movement's Colin Yeo, who said that the intention since 2012 has been to eliminate discretion from the Rules and this has instead removed any human element and judgment. Yeo highlighted the problems lawyers face trying to keep up with the frequent changes and he criticised the quality of the changes, saying: "The changes are often hurried out, which means they can be badly written. They can be very difficult to understand, even for judges and lawyers. We've seen a number of errors in drafting that have to be corrected in later versions."